Whether taste constitutes protectable subject-matter under EU copyright law is one of the questions which the CJEU will have to answer in the near future. Indeed, the Dutch Court of Appeals of Arnhem-Leeuwarden has, in the course of an appeal procedure (only available in Dutch), turned to the CJEU for a preliminary ruling on the scope and extent of EU copyright law, more precisely on whether the taste of a food product falls within its ambit. Having regard to the vague nature of the Infopaq criterion, which was further developed in the Painer case and which requires that, for copyright protection, subject-matter shall be original in the sense that it is its author’s own intellectual criterion, ambiguous cases flowing therefrom were foreseeable. To all cooks: your time has come! T he dispute arose in the Netherlands in 2015, between two cheese producers and manufacturers. The claimant, Levola, and the defendant, Smilde Foods, are both producers of a cheese product – the former called “HEKS’NKAAS” and the latter ‘Witte Wievenkaas’. According to Levola, ‘Witte Wievenkaas’ infringes Levola’s exclusive right of reproduction, protected under Art 13 Dutch Copyright law. However, for such an infringement claim to be valid, the work must, in the first place, be protected by copyright. The core question of this dispute therefore is whether ‘taste’ in itself can be the subject of copyright protection. The answer to that question will most probably come as a relief to all Dutch cheese producers – in the sense that it will clarify the issue – as this is not the only dispute in which Levola claimed copyright infringement of its HEKS’NKAAS cheese. 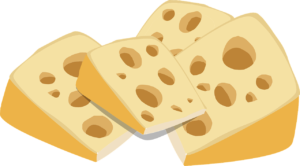 Indeed, on 3 May 2017, Levola similarly claimed, before the Dutch Court of The Hague, that the cheese ‘Magic Cheese’, which is brought onto the market by the European Food Company, constitutes an infringement of copyright because of its similar taste. The main ground on which Levola based its claim is the 2006 judgment of the Dutch Supreme Court in the Lancôme case, in which the Court held that perfumes are eligible for copyright protection where they are perceptible – in this case, through smell – and original. The fact that there are some limits as to the human capacity to distinguish smells; that not all humans perceive the same quantity of smells; and that the copyright provisions and limitations do not all lend themselves easily to the subject-matter of smell do not, according to the Court, rule out perfumes being eligible for copyright protection. Arguably, if this line of reasoning is followed, it does not seem far-fetched to consider the taste of food as also being capable of copyright protection. Indeed, the ‘perceptibility’ criterion could be met. While the smell of a perfume can be perceived through human olfactory senses, the taste of food can be perceived through human palate senses. The fact that taste, just like smell, has a subjective character – in the sense that everyone perceives it differently – should not be a valid reason for excluding it from copyright protection as, to some extent, it could be said that works of art also tend to be subjectively perceived and understood. However, it should be borne in mind that the Lancôme case was decided in 2006 and thus before the CJEU ruled on the Infopaq case. Having regard to this, the French Court de Cassation maintained its earlier position by deciding, in 2013, that the smell of a perfume could not be a protectable subject-matter under copyright law. Whereas the main reason for denying such protection was, in 2006, that perfumes are simply the product of applied know-how (and therefore not the creation of an expression), the main obstacle, in 2013, was formed by the unidentifiable character of perfumes. Importantly, the CJEU has never settled the issue and ruled on that matter. The unidentifiable character of the taste of food also clearly forms an obstacle with regards to its plausible copyright protection. While the Dutch Supreme Court ruled in the Lancôme case that the smell of a perfume cannot be reduced to its ingredients or formula, the Court of The Hague, in the dispute concerning ‘Magic Cheese’ and ‘HEKS’NKAAS, did take into account the ingredients of the cheese at issue in order to conclude whether creative choices had been made. Moreover, that same Court agreed to actually taste the cheese in order to determine whether it contained some surprising elements capable of making it an ‘original’ work (see Painer). In contrast, the Court of first instance of Gelderland rejected the idea of ‘tasting’ the food altogether. However, as all culinary experts amongst us will argue: how could something as ‘dynamic’ as the taste of food be reduced to something as ‘static’ as its recipe. Another feature of the taste of food, which emphasises even more its ‘unidentifiable’ character and which distinguishes it from all existing copyright-protected works is its evolving character. As was pointed out by Smilde Foods, the defendant in the dispute, taste varies in accordance with its age, exposure to air, environmental temperature and when in time it is consumed in relation to its expiry date. Looking at it from this angle, it could be claimed that “the” taste of a food product does not exist. Furthermore, having regard to Art 2(1) of the Berne Convention, it could be argued that protecting taste would be contrary to the original objectives of copyright law. Indeed, all examples listed in that provision are works which are capable of either being heard or seen. Therefore, whether taste should be protected by copyright (unlike ‘can’ be) is a crucial question which should not be overlooked by the CJEU. Keeping in mind that the cheese at issue (the process for obtaining it) could be protected by patent law (which was obtained in 2012) and that its brand could be protected by trademark law, is it really desirable to also have its taste protected by copyright law? The least that can be said is that the CJEU ruling will provide us with some clarification on the scope of copyright law. However, if the taste of food turns out to be protected under EU law, clarification on how infringement should be assessed by the relevant courts would also be much welcomed (nota bene: this is also one of the preliminary questions referred by the Dutch Court of Appeal). In any case, Levola can be satisfied of one thing: the CJEU will not soon forget the taste of “HEKS’NKAAS”.